The Teradici APEX 2800 PCoIP® Server Offload Card insures the success of VMware ViewTM VDI deployments by offloading PCoIP image encoding tasks, and reducing server CPU utilization. This empowers IT managers to protect and ensure a consistent, high quality user experience, while enabling increased VDI consolidation ratios. The APEX 2800 is a complementary accessory to VMware View VDI deployments that’s simple to install and setup. The APEX2800 can reduce server CPU utilization by up to 50%, freeing up valuable CPU cycles. IT managers can use these cycles to provide more headroom to the VDI implementation, ensure consistent application performance or allow existing virtual machines to run more intensive applications. By constantly monitoring graphics encoding demands of each virtual machine, the server offload card dynamically and seamlessly offloads up to 64 of the most demanding displays from the CPU. The APEX 2800 automatically determines – in real time – which displays will benefit the most from hardware acceleration. The transitions to and from the CPU and the APEX 2800 happen instantly and transparently, protecting user experience even as loads change. As the APEX 2800 reduces server CPU utilization, the extra headroom can be used to enable consolidation ratio improvements. In typical office environments, IT managers could achieve consolidation ratio improvements of 1.4 times, dependant on their users’ workload profile. In use cases with high levels of graphics changes, such as many users watching video at the same time, consolidation ratio improvements can be up to two times. IT managers could also achieve consolidation ratio improvements by choosing to reduce overall CPU headroom. 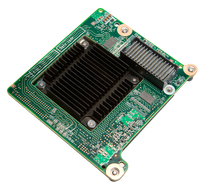 Because the APEX 2800 effectively manages unpredictable peaks in CPU utilization, the needed amount for CPU headroom is reduced. The server offload card enables overall IT cost reductions when more users are supported on each server. It provides significant cost savings compared to adding another server, and could therefore result in fewer servers overall. Reductions in data center floor space, power consumption and maintenance combine to lower overall IT cost per user. Designed for use in industry standard servers, the APEX 2800 is an easy to install PCI Express card that is simple to setup. Simply insert the card in the VDI server, install the drivers and click to enable hardware acceleration in VMware View Administrator. The APEX 2800 is compatible with all existing PCoIP zero clients and VMware View software clients. It is supported by VMware ESXi 4.1 (ESXi 5.0 support coming soon) and VMware View 4.6 or 5.0.